Seniors Adam Kampsen and Doug Mages earned All Conference honors for the Bulldogs boys' basketball team this winter. Team awards were announced on Sunday, March 28. Seniors Adam Kampsen and Doug Mages earned All Conference honors for the Bulldogs boys' basketball team this winter. The honors, along with team awards, were announced at the team's end-of-the-season potluck dinner on Sunday night. Kampsen, at right, averaged 17.7 points per game, 9.2 rebounds per game, 3.9 assists per game, and 2.0 steals per game for the Bulldogs this winter. He led the team in scoring, rebounding, and assists. 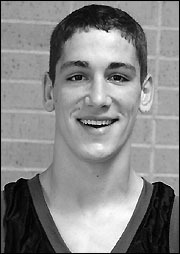 Mages, below, averaged 15.6 points per game and 6.9 rebounds per game. He also led the team in steals (58), averaging 2.6 per game. Kampsen finished his four-year varsity career with 902 points, becoming the eighth male player for the Bulldogs to top 900 points in a career. 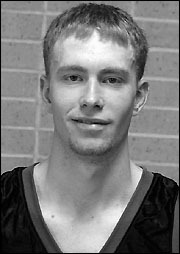 Kampsen also averaged 12.1 points per game as a junior and 11.6 points per game as a sophomore. Leading career scorers for the Bulldogs is Don Liestman (1955-58) with 1,286 career points. Other 1,000-point scorers for the boys' program were Tom Notch (1987-90) with 1,028 points, Dave Hartmann (1967-70) with 1,017 points, and Ron Hood (1949-52) with 1,007 points. Also topping 900 career points were Scott Deadrick (1978-81) with 993 points, Terry Miller (1984-86) with 914 points, and Tory Spanier (1993-96) with 903 points. 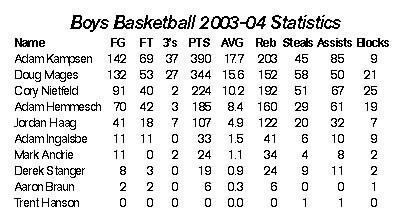 Varsity team awards for 2003-04, also given on Sunday, include Mr. Offense for Mages and MVP for Kampsen. Senior Adam Ingalsbe was named Mr. Dedicated and earned the Bulldog Spirit Award. Senior Adam Hemmesch, who averaged 7.3 rebounds per game, was named Chairman of the Boards. Senior Jordan Haag was named Mr. Defense. And ninth grader Cory Nietfeld - who averaged 10.2 points per game, led the team in blocked shots, and was second in assists, rebounds, and steals - was named Most Improved. The Bulldogs started the season strongly, winning their first four games and sporting a 6-4 record in January, but the team lost its last 12 games of the season and finished 6-16. "The season was action packed and full of challenging games and situations. The fan support has been great and the players and coaching staff realize this very much," said coach Phil Carlson. "We will miss our seniors, and we look forward to our future for our younger players." The Bulldogs will graduate five of their top six players this spring: Haag, Hemmesch, Ingalsbe, Kampsen, and Mages. Three seniors - Hemmesch, Kampsen, and Mages - are scheduled to play in an area All Star game hosted by BBE on Saturday, April 3, at BBE High School in Belgrade. The girls' game, including Bulldogs senior Amanda Glenz, starts at 5 p.m., with the boys' game following. Tickets will be sold at the door.